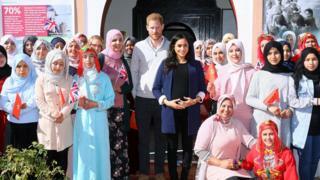 The Duke and Duchess of Sussex have met young women in Morocco to show support for girls’ education. The couple were welcomed to a boarding house in the village of Asni by the girls, who waved flags and sang songs. During the visit, the pregnant duchess was given a traditional Moroccan henna tattoo, which is intended to bring luck to her first child. 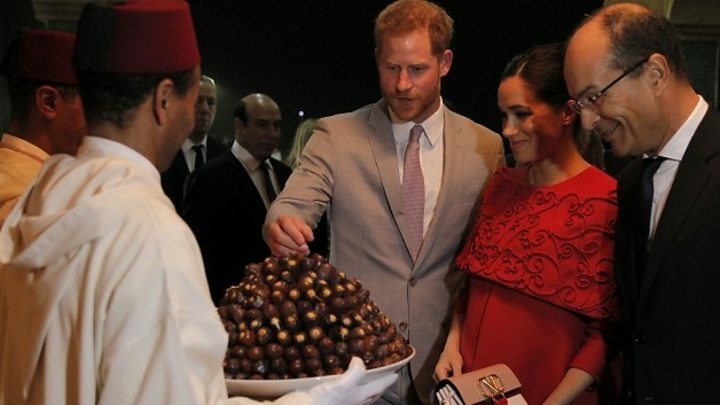 Harry and Meghan, who flew from the capital Rabat by helicopter, are on a three-day visit to the country. The Duke and Duchess announced their pregnancy last October and the baby is expected at the end of April or early May. When the artwork was finished, the duchess said the design was “really lovely” and showed her husband. The couple’s first official trip to the north African nation is aimed at strengthening links with the UK. The secondary school is run by a Moroccan group that provides classes for girls from rural areas whose families cannot afford their education. Kensington Palace said the charity Education for All “has given girls from the poorest villages and most remote areas of Morocco the chance to reach their potential and contribute to Morocco’s continued development”. Meghan and Harry walked along a line of students and touched their hearts each time they shook a pupil’s hand. The duke asked one pupil “is this the best school in Morocco?” as they were led inside the boarding house. The photographers might have been there for the bump; the journalists to see the last royal visit before the baby is due. But Harry and Meghan were there to show that a royal visit could have real purpose. So the focus was unremitting; from start to finish in the dusty mountain town of Asni, Harry and Meghan homed in on education and in particular opening it up to girls, and granting them opportunities that women have been denied. There was no pomp, little ceremony, not too many handshakes; they wanted to meet the teachers and students, to encourage them, to shine a spotlight on their work. A while ago a palace official told me that in 2019 we would start to see Meghan’s influence and interests; they could not have been clearer today. Harry and Meghan are determined to do things differently. The couple visited classrooms, where most of the girls speak French. The first Education For All project was opened in 2007 and now has 50 girls enrolled at university.